Beautiful Incentives: Win a $50 Visa Gift Card! 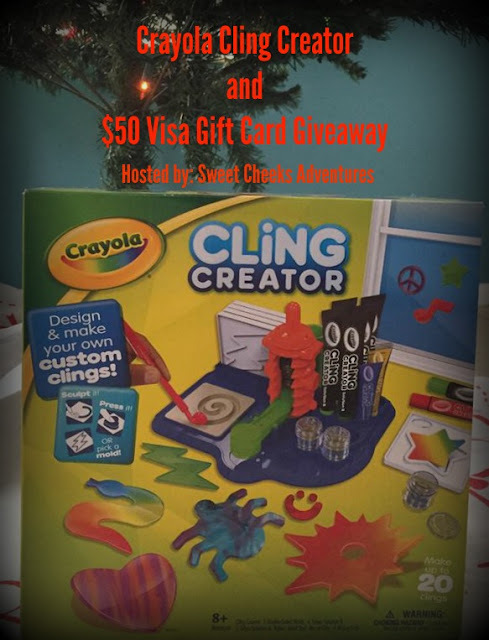 Sweet Cheeks in offering up a give away for a $50 Visa Gift Card! I know everyone will want some cash after spending it all on gifts. One lucky winner will be able to replenish some of their money! Good Luck! Crayola has a new product on the market!! Check out the new Cling Creator! It's so much fun and a great way to let the kids decorate with their own style. You can take a look at what Ashley at Sweet Cheeks Adventures thought HERE! Dates: Starts December 15, 2015 1:00 pm EST. Winner will be chosen December 23, 2015 11:59 pm EST. This looks like a fun activity to share with the kids. The whole family could have fun making clings. We have the crayons, markers and the dry erase board in our house. We have washable markers and crayons in our home. We have markers and crayons in our home. Same thing I had growing up.